A Wonderful Place to Eat. 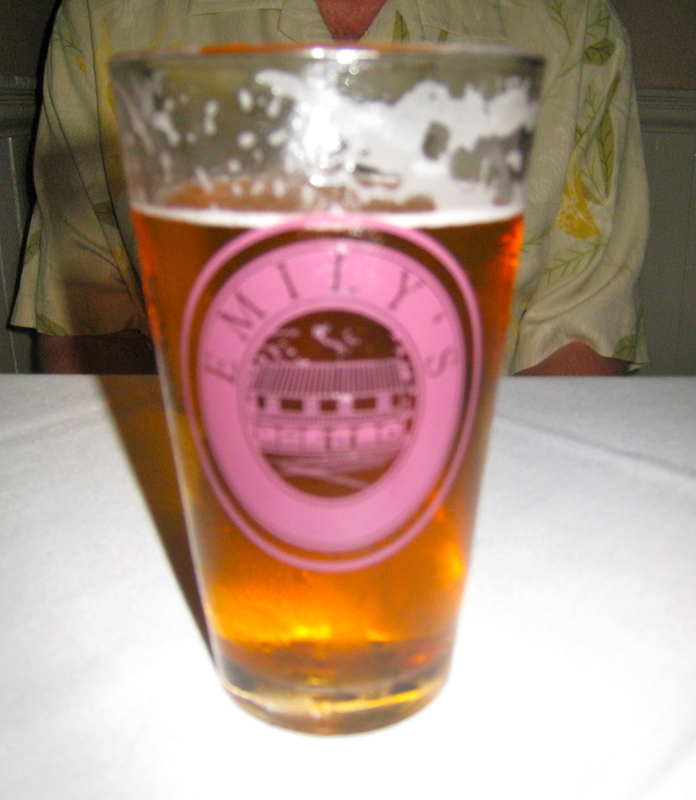 My husband Mike and I were really lucky to (1) find and (2) get a table to (3) eat at Emily’s last Saturday night. After our daughter Tory’s softball games (count’em 3) were rained out at the Pegasus Tournament in Morgantown, PA, we took a bunch of the girls and went to the movies (“Despicable Me,” anyone? It was a hoot!). The girls stayed for a second movie, which left Mike and me at loose ends. Mike started to search for restaurants on his Blackberry; I drove. He suggested places that I, having been in the area before, quickly shot down for one reason (greasy) or another (bland), until he mentioned Emily’s (http://www.EMILYSRT10.COM/dinnermenu.html). I hadn’t heard of it, but it wasn’t far from our hotel in Morgantown so off we went. 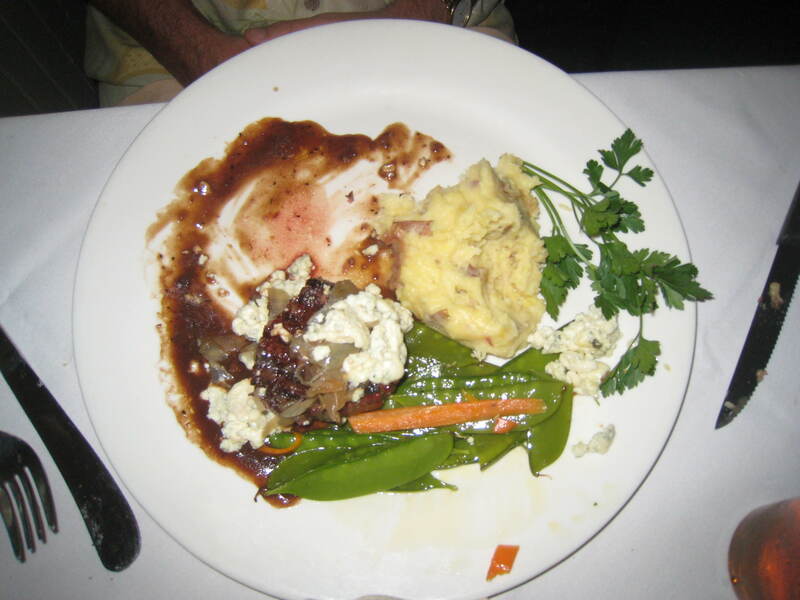 Emily’s is located in a Victorian house that has, over many years, been home to a restaurant of some sort as well as a post office. If you visit Emily’s, walk into the bar and take a look at the old mailboxes. Likely you’ll have time to peruse the bar and lobby as you wait for a table, unless you made reservations. 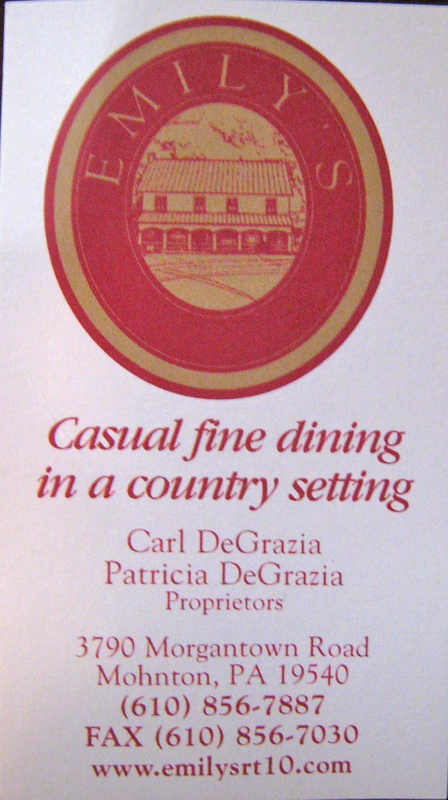 We didn’t have one (reservation, that is) and we waited quite pleasantly for about 20 minutes for our table. We were ushered into one of the ground-floor dining rooms (dining rooms are also located on the second floor, according to our waitress). It was white tablecloths and heavy silverware all the way. The atmosphere is lovely! And on warm evenings you can request a table outside on the deck, where you can enjoy the sounds and sights of the rural location. To start, Mike and I shared a baked brie topped with cashews — oozing slightly and sitting atop a warm apricot sea. We ate every bite on water crackers. Our house salads were crisp and tasty with homemade dressing (balsamic for me and raspberry vinaigrette for Mike). 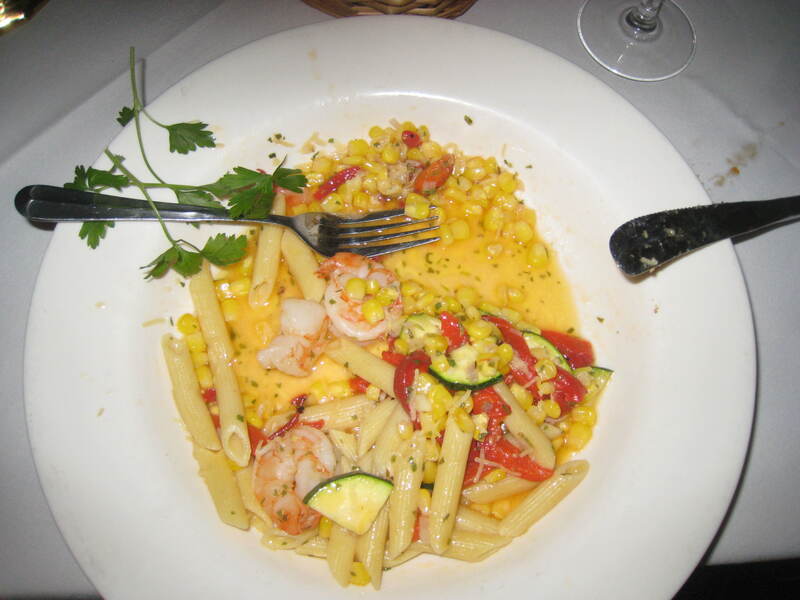 I loved my pasta dinner, one of the night’s specials: shrimp with fresh corn, zucchini (imagine that!) and roasted peppers in a light broth y sauce. Mmmmm. I forgot to take a photo before I ate half. Sorry! Mike was happily chewing away until I interrupted him to take this photo! And did I mention the beer and wine selections? No? Well, stop by Emily’s and take a sip or two. You’ll be very glad you did. Trust me! I recommend Emily’s for its food, libations and atmosphere. And our waitress was really nice too! A great selection of beer. . .and wine! i hope you are gettinh a commission from Emily’s — you deserve it ! !